When Guru Nanak was nine years old, his father was determined to make him wear a janeu (also known as yajñopavītam). Mehta Kalu worried that his son freely mixed and played with muslim and 'untouchable' (low caste) children. The Janeu is a thread (made from cotton, hempen or wool) that is worn by the hindu brahmins, kshatriyas and vaishyas of India. The thread of 'Janeo' suggests the development of a male, from a young boy to a man. The Janeu ceremony reinforces the superiority of a persons caste. This is form of racism in India has been used to control the hindu masses for centuries. Historically, hindus were indentified by the type of janeu they wore. It is believed that a boy cannot be surmised as 'dvija' (twice born) until he wears the janeu. Until a boy is given a janeu, he is seen as an outcast. The ceremony suggests that the wearer of janeu can take part in future family rituals.High caste hindu's believe that low caste hindu's dream of dying, to be reborn again into a higher caste so that can to wear the thread. The string was to be draped over young Guru Nanak by Pandit Hardyal, the family's 'purohit' (brahmin priest). Guru Nanak could see a lot of preparations were going on. Being the first major religious ceremony in the life of his only son, Mehta Kalu planned a big feast. An atmosphere of hustle and bustle was visible all around. Lots of relatives from near and far, as well as, friends and every one in the village were invited to participate in the event and enjoy the feast. Young Guru Nanak would ask questions about each and every thing. He would study the answers and then give his own logical explanations which often differed with the established thought and practices around the village. Guru Nanak was becoming well known for his lateral, out of the box thinking, where he asked unusual questions and gave intelligent answers to questions from other people. His logic was irrefutable and every one loved him for his humility in asking the questions, and for his extraordinary genius in answering questions and giving explanations to his answers. He was the only one in his village who dared to think laterally and question the age-old explanations being given by both the hindu and muslim priests. Guru Nanak had an elder sister named Nanaki. Brother and sister were very close and would often openly discuss their thoughts with one another. Regarding the ceremony of the janeu, Nanaki had asked her brother, 'Do you know what this all is about?' 'Yes', replied Guru Nanak, 'I have heard I will be given a janeu by the purohit'. 'Can you tell me why you didn't get a string?' Guru Nanak asked his sister. 'You're older than me', continued Guru Nanak. 'I don't know, maybe girls are not allowed to have one. Mother doesn't have one either, why don't you check with her or father or ask the purohit?' answered Nanaki. Nanak approached his father, who was busy organising the event, making sure that every thing was going smoothly. Mehta Kalu dearly loved his son and was very tolerant of him. However as most father's do so, he wanted what he thought was best for Guru Nanak. 'Can I ask you a question?' said Guru Nanak. 'Yes, but please be quick, there's a lot of things I have to do', replied his father. 'What is this janeu? and why do I have to wear it? and why does Nanaki not have one? ', asked Guru Nanak. 'To be honest, I don't know the exact answer to these questions. All I know is that I have had this janeu since I was your age and my father, grandfather and great grandfather, all of them have had this string,' replied Metha Kalu. 'Can I ask these questions to our purohit?' pleaded Nanak. 'I think that is best thing to do. Pandits are the most learned persons in our community and our purohit pandit Hardyal will be able to answer all your questions', said Metha Kalu. 'Thank you', said Guru Nanak. Word quickly spread that today Nanak would ask the pandit the meaning of the janeu. This was something that nobody had done before and everyone expected a very lively and informative discussion between the child genius Guru Nanak and the scholarly pandit. There was a huge gathering at the ceremony and the pandit Hardyal arrived on time. He was greeted with great respect by the family, the close relatives and everyone in attendance. 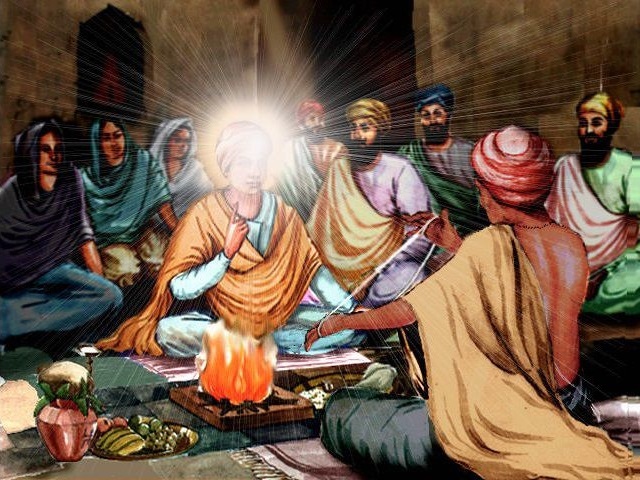 Guru Nanak's father told him that his son Nanak wanted to know all about the janeu before he was to be adorned with the string, and had requested an explanation for the ceremony from the pandit. Pandit Hardayal told him that he already knew about this and he had come prepared. He told Mehta Kalu that he expected this because he knew that Guru Nanak being an inquisitive child would question him about ritual. 'Every one knows how intelligent Nanak is from school where he progressed in his studies very quickly. He asked pandit Brij Nath and Mulla Qutab-ud-din very unusual questions about the books he read with them. So I expected this and am well prepared for all his questions', said pandit Hardyal. The havan, the sacred fire, was lit as chanting of verses from hindu religious books commenced. Everyone gathered around the fire. Pandit Hardyal asked Guru Nanak to sit by his side so that he can perform the ceremony of the sacred thread. Guru Nanak sat close to the pandit and said, 'Pandit ji, can I ask you some questions about janeu?' 'Yes, you can. Your father has already told me about this. Let us finish the ceremony first and then I will answer all your questions,' replied pandit Hardyal. 'Pandit ji, if you answer my questions first, then I will be able to enjoy the whole ceremony, so please allow me to ask you these questions before you start', urged Guru Nanak. Pandit Hardyal replied, 'I knew that you would ask me things about the ceremony so I came prepared to answer all your questions. However before you ask me a question; I will explain in detail for the benefit of everyone here what the significance of janeu is. I am sure this will answer most of your questions.' 'Yes, that will be good', answered Nanak. Pandit Hardyal started addressing the audience. 'Upanayanam, is the initiation ritual by which boys are invested with a sacred thread, to symbolize the transference of spiritual knowledge. The janeu ceremony is a very important event in the life of a hindu as he gets the yajjopavita the sacred thread in this ceremony. According to our religious books and Manusmriti, the second birth happens when he is given the sacred thread (janeu), which we will be doing shortly to Nanak. There is a third birth, which takes place on the initiation to the performance of a sacrifice. Out of these three births the second one is the most important as this is for the sake of Vedas. In this birth the goddess of knowledge, Savitri is his mother and teacher, the Brahmin guru is his father. One who has not been initiated cannot read or pronounce any Vedic text except at the time of funeral rites'. 'A Brahmin boy is eligible for the ceremony of the sacred thread at the age between five and eight, the Kshatriya at the age between nine and eleven and Vaisya is entitled to it at the age of twelve. The age for the third birth, the savitri initiation is sixteen, twenty second, and twenty-fourth for a Brahmin, Kshatriya and the Vaisya respectively. As you know Nanak is more than nine years old and he is born in Kshatriya caste, it is the time for him to get this sacred thread. His parents are very religious and have organized this function for their only son. As you know Nanak is a genius and once initiated by this ceremony of sacred thread he will have access to the treasure of the Vedas and other religious books. I can say without any doubt that one day he will become a great scholar of our Vedic texts. When Nanak will study our religious text he will find this information in Manu Smriti and other religious texts'. Pandit Hardayal recited verses from Manu Smriti and other religious texts. The bulk of the audience do not understand what he says but they bow their heads in respect and awe of the scriptures. He glances at the audience, which was spell bound at his erudition. He looked at child Nanak who was listening very attentively imbibing each and every word and seems to have understood him very well. Pandit Hardayal continued. 'All this is from our ancient scriptures. We should never ever question our scriptures. Any one who questions it will not only go to hell himself but his entire family and next seven generations are also doomed. As you know Brahmins, Kashtriyas and the Vaisyas wear the sacred thread. Wearing the sacred thread is a very holy and sacred ceremony amongst the Hindus. A Brahmin becomes a true Brahmin only after this ceremony. Similarly a Kashtriya and the Vaisyas become true Kashtriyas and Vaisyas only after the ceremony of sacred thread. It is said in our Shastras that Janmana jayate sudrah, karmana jayate dvijah. It means that by birth we are all Shudras, but by this ceremony we are born again as Brahmins or Kashtriyas or Vaisyas'. 'I tell you more in detail about the significance of this sacred thread. It is not an ordinary thread. It is spun and twisted by a brahmin. Its length is ninety six times the breadth of the four fingers of a man. It denotes that one should be a Brahmchari in thought, word and deed. It consists of three cords. Each cord represents a Veda - the Rig Veda, the Yajur Veda, and the Sam Veda. It also represents the trinity of Brahma, Vishnu and Shiva. The knot in the middle represents the formless Brahma, the supreme principal. The three cords also represent the three aspects of Maya - the Sattva, the Rajas and the Tamas. The knot in the middle represents Ishvara who controls Maya. The three cords of the sacred thread reminds the wearer that he has to pay off three debts he owes to the Rishis, to his ancestors and to the gods. The three strands also represent past, present and future; the three states - the wakefulness, dream and deep sleep; it also represents the three dimensions known as heaven, earth and the nether regions. Another important meaning of three strands is ida, pingala and sukhmani nadi through which the kundlaini energy manifests as supreme consciousness. After getting the sacred thread, a boy becomes eligible to recite the most pious mantra in the world, which is Gayatri Mantra. Gayatri is Vedmata. Just as water manifests in four different forms of ice, vapour, air and liquid, and fire manifests in the forms of burning, heat, light and movement, so also Gayatri manifests in the form of four Vedas, four kinds of knowledge. Gayatri is the mother and four Vedas her progeny. Those who worship God at the three Sandhyas and repeat the Gayatri holding the Brahman knot of their sacred thread derive immense strength and power. And you should also not forget that a Brahmin meditating upon the Gayatri holding the Brahma knot has the power to bless and curse others. As per our Shastras even gods are powerless before the curse of a Brahmin and blessings of Brahmin can force the gods to give you all favours'. 'Unfortunately not', replied Guru Nanak. Where Is The Gender Equality? 'Pandit ji, tell me why do women do not get this janeu?' asked Guru Nanak. 'No, it is not unfair as it is written in Manu Smriti and Shastras. I told you before you should never ever question your religious books. It is a great sin. Besides you should not talk about death at this auspicious occasion. Once we finish with your questions I will recite some pious verses to purify the atmosphere of the sad things you have just said' pandit Hardyal mutters something from his mouth that no one could hear. 'I do not agree when you say that it is a sin to question the authority of the religious books,' replied Guru Nanak. 'First of all it is not a matter of questioning the authority; the fundamental question here is to understand what is written in what we call our religious books. We cannot understand unless and until we ask questions. And if we do not understand we cannot follow the instructions contained in these books. Besides God gave us a brain to think and question, so there cannot be a sin in using our intellect to know what is wrong or right. We must study, in depth, all our scriptures to gain knowledge. We can do so only when we question and seek answers. I have a personal experience in this regard. While at school with pandit Brij Nath, I finished reading all the books in his library. While reading these books, lots of questions came to mind and I shared these questions with pandit Brij Nath ji and other learned people.' said Guru Nanak. 'I confirm what young Mardana has just said. I have ventured many times to discuss Islam with Nanak. But every single time I learned something from him.' Chipped in Sayyad Hussain, who being a neighbour was one of the guests to the function. Why Are Normal People Not Allowed The Janeu? Pandit Hardyal was visibly upset at this unexpected turn of discussion and intervened quickly to salvage the situation. 'Are you finished or do you have any more questions? we are already getting late for the ceremony', he said. 'Yes I have more questions. Pandit ji, could you please tell me why Shudras (low caste outcasts) don't get this janeu?' asked Guru Nanak. 'Shudras are not eligible for this as per our religious books' said the pandit. 'I can not change what is written in our Vedas and Smrities', replied pandit Hardyal. 'Pandit ji, why do people have different types of janeus? ', asked Guru Nanak. 'Because they are born in different castes', replied pandit Hardyal. 'Wouldn't it be nice if all wore the same janeu? ', asked Guru Nanak. 'Pandit ji, why do people get janeu at different ages of their life? ', asked Guru Nanak. 'As I told you earlier children born in different castes are eligible for investiture of janeu at different ages', replied pandit Hardyal. 'Why? That is my question. Does it mean that a person matures quickly if born in a brahmin family? ', asked Guru Nanak. 'I don't know. I haven't made these rules. These are the inviolable rules from our scriptures', pandit Hardyal was getting a little bit annoyed. 'Pandit ji, I understand that you have not made these rules, but I want to know if you have any logical explanation for this outright discrimination', asked Guru Nanak. 'No I don't have any explanation for this nor do I need to give you one. In fact you are not supposed to ask me these questions', pandit Hardyal was feeling a bit uncomfortable now. 'Pandit ji, why do we have to shave our heads for this ceremony? God gives us this gift. So we should take care of it in every possible way. If we shave our hair off we are showing our disrespect to God', asked Guru Nanak. 'If keeping of only a tuft of hair of is so good, then we should not shave our hair at all?' suggested Guru Nanak. 'That is up to you, your hair will grow back soon' pandit Hardyal was trying to draw the conversation to an end. 'Pandit ji, you said that it gives us immense powers if we recite Gayatri Mantra holding the Brahma knot of the sacred thread'. 'That is right', replied pandit Hardyal. 'Yes, that is the mantra. But you should not have recited it without the janeu' said pandit Hardyal. 'Pandit ji, if I translate this in the language that all of us can understand, it says "Oh Almighty Supreme Sun, impel us with your divine brilliance so we may attain a noble understanding of reality." Is this not an invocation of the Sun god to give us divine knowledge?' asked Guru Nanak. 'Yes, it is. Pandit Brij Nath has taught you very well', replied pandit Hardyal. Shouldn't We Pray To That One God Who Is The Supreme Creator? 'No, you should go by your religious books', replied pandit Hardyal. 'Pandit ji, you said that after this ceremony a person gets a new birth and Savitri, the goddess of knowledge is his mother, and the brahmin Guru is his father.' said Guru Nanak. 'Pandit ji, Guru means that which dispels the darkness of ignorance. Then it is wrong to call brahmin a Guru on the basis of his caste only. The Word that conveys us Knowledge is the real Guru. And this Guru is both our mother and father in this second birth', said Guru Nanak. 'Nanak you are crossing all limits. You are questioning the authority of our religious books. You are questioning my authority to be your Guru', pandit Hardyal was losing his patience. 'Yes, I am', replied Guru Nanak. 'Mehta Kalu, did you hear this! Your son is questioning my authority! He is questioning everything that has been going on for generations. Do you realize the repercussion of what he is doing right in front of the whole village?' pandit Hardyal was very upset. Controlling his anger he tried to involve Guru Nanak's father in the discussion. Are We Doing Right Or Wrong? 'Nanak, we should not question the authority of our purohit. He is our family priest and is a very learned person. All purohits are learned persons. Finish your questions quickly so that he can perform this ceremony. It is for your good.' Mehta Kalu intervened in an attempt to pacify the priest. 'Pandit ji, it is not a question of your authority. It is question of whether what we are doing is right or wrong?' asked Guru Nanak. 'Who will decide what is wrong? You! Or your elders?' pandit Hardyal grabbed this opportunity to score a point. But Nanak knew where he is coming from and quickly replied, 'Neither me nor our elders. It is Knowledge that decides what is right or wrong. Knowledge is the real Guru, the true Guru. Knowledge, I believe, does not come with age; it comes with God's grace'. 'OK then, tell us what your Guru says about janeu', asked pandit Hardyal trying to put pressure on Guru Nanak. 'Pandit ji, my Guru tells me that the janeu should not discriminate and should be the same for all of us, in fact the same for the entire human race', said Guru Nanak. 'No one has ever seen such a janeu. Muslims don't wear the janeu. Shudras can't wear a janeu', pandit Hardyal said with a smile on his face. He thought Guru Nanak would be defeated in his own argument here. He turned towards the audience, 'Has any one seen such a janeu?' 'No', was the reply from most people in the audience. 'Pandit ji, exactly, that is the point. The janeu that you offer is not applicable to a muslim, it is denied to women and Shudras. The janeu that my Guru gives is meant for the entire human race.' Nanak replied in a very calm and composed manner. 'Show me this janeu? ', pandit Hardyal still believed that Guru Nanak would falter in his argument before long. Nanak now stood up and started addressing the entire audience. 'I agree with the view that there has to be a formal induction process for any person who wants to embark upon the journey of true knowledge and faith. Pandit ji, you are right when you say that this is our second birth. We are all children of the same God and all are entitled to this second birth. So, all of us should go on this journey. Hence we should have the same process in place for all of us. You are saying that it is mandatory for a hindu to wear janeu. But at the same time you deprive more than half the population of hindus from what you call a very important thing in the life of a hindu. The ceremony of sacred thread is being used as a tool to discriminate and divide mankind into different castes. This is a ploy to force people to accept a person born in a Brahmin caste as their perpetual spiritual Guru. In my opinion the true Guru is knowledge which is beyond any caste or creed'. 'The Sacred Thread that most of you have does not help you in any way towards the achievement of your ultimate goal in life. People are committing serious crimes while wearing this sacred thread. It does not stop them from doing so nor does it stop them from cheating and telling lies. As a result, you land yourself in trouble. When it gets soiled or is broken, you get a new one from your purohit brahmin. You treat him with food and gifts on this occasion. The new sacred thread is as ineffectual as the old one. It is still a piece of cotton, hempen or wool. It does not make a difference whether a brahmin girl spins it or your own daughter spins it for you. It will have same qualities of a thread even if a Sudra, who is not entitled to have it, spins it. However there is a sacred thread that only you can spin and which will make all the difference in your life. You don't have to pay your purohit for it. There is no age for it. It is same for all genders, castes and creeds'. 'The sacred thread, given by your purohit, does not serve any purpose when you put it on your bodies. Instead, if we put a sacred thread in our minds; that will work for sure. Since it is a thread for our mind it has to be made from special materials. The cotton we should use will be mercy, to be kind and loving to all creatures on this earth. When we practice humility, are kind and considerate to all, that will result in contentment for our lives'. So the thread that we spin out of this cotton is contentment. The satisfaction and contentment in life leads to self-restraint. So the continence or self-restraint is the knot on this thread. And to make this thread strong we must twist it with our love for knowledge of truth. The thread that you are putting on your bodies does not help you restrain your body from indulging in various acts that leads to shame and untoward situations. Nor does it help to strengthen your spiritual life. But the thread that you will put on your mind will go a long way in restraining you from doing things that lands you in trouble and it will also make you spiritually strong. The thread that you put on your bodies gets burnt in your funeral pyres when you die'. No one ever remembers a person if he has the sacred thread or not. What we remember is what he has done in his life. The sacred thread that you put on your mind will motivate you to good deeds that will outlive your death. Pandit ji, this is the thread, which every one should have. You should have it. It is a must for everybody including Shudras. It is a must for people from all races and religions. Now tell me are you capable of giving me this sort of thread? If so; I would love to have that thread from you.' asked Guru Nanak. Everyone was looking at pandit Hardyal for an answer. It was obvious from his face that he had been defeated. Instead of answering the question, he turned towards Guru Nanak's father and released his anger. 'Mehta Kalu, your son is insulting me in front of the whole village and is showing total disregard for our religious scriptures. He is rebelling against our age-old traditions. Despite this, you did not intervene, nor did you stop him. I warn you to stop this evil. I warn you that there will be grave consequences of what he has done today, for you and your coming generations. You must control this rebellious child, otherwise I will not help you in any way. I can see an impending curse looming large on your family. Don't come running to me for help unless you punish this child and make him accept this sacred thread from me'. Guru Nanak was an extremly popular child in the village, he was loved by all. Before Mehta Kalu could say something, many of the village elders from the audience objected to the outrageous outburst by pandit Hardyal. They told him that they did not find anything objectionable in what Guru Nanak had said. They suggested that as Guru Nanak was young there was plenty of time to persuade him and pandit Hardyal should convince Guru Nanak with words, and not threats, to put on the janeu. The suggestion appealed to pandit Hardyal as it gave him an opportunity to get away with some honour. Turning towards Mehta Kalu, he said, 'Ok Mehta Kalu, I agree with what the elders are saying here and advise you to keep your son under control. Do not allow him to mix with people from low castes. I have already warned you many times regarding this matter'. Rai Bular, the head of the village and employer of Mehta Kalu, had been listening intently to the whole discussion. Rai Bular said to the Guru Nanak, 'Nanak even though you are a young child, you have the wisdom of an old man. God has blessed you and I, for one, look upon you as the saviour of this world. You are the only one capable of giving the sacred thread that you spoke about. I bow before your wisdom and courage'. Pandit Hardyal collected the fee for his services and left in haste. Everyone enjoyed the feast while talking about the event, they were witnesses to a key moment in history. 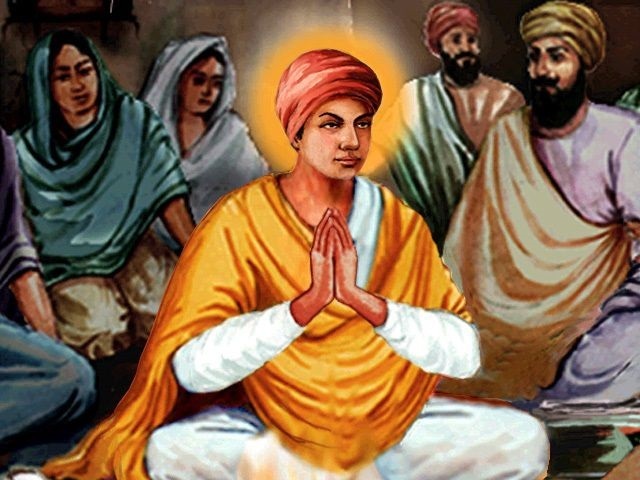 Many people gathered around Guru Nanak and congratulated him for his courage and wisdom. Every one was talking about this episode. No one had ever dared question what the brahmin purohit said or did. The low caste people were especially happy, for once someone had suggested that they should be treated equally. Blessed are those mortal beings, O Nanak, who wear such a thread around their necks. You buy the thread for a few shells, and seated in your enclosure, you put it on. Whispering instructions into others' ears, the Brahmin becomes a guru. He commits thousands of robberies, thousands of acts of adultery, thousands of falsehoods and thousands of abuses. He practices thousands of deceptions and secret deeds, night and day, against his fellow beings. The thread is spun from cotton, and the Brahmin comes and twists it. The goat is killed, cooked and eaten, and everyone then says, "Put on the sacred thread". When it wears out, it is thrown away, and another one is put on. Believing in the Name, honor is obtained. The Lord's Praise is the true sacred thread. There is no sacred thread for gender, and no thread for woman. The man's beard is spat upon daily. no thread for the tongue, and no thread for the eyes. The Brahmin himself goes to the world hereafter without a sacred thread. Twisting the threads, he puts them on others. reading their horoscopes, he shows them the way. Hear, and see, O people, this wondrous thing. Sri Guru Granth Sahib Ji, Guru Nanak, Ang 471. Guru Nanak's reluctance was in participating in rituals which have no benefit and relevance in living a pure life. The Amrit Sanskar of Sikhi cannot be compared to the Janeu as it is not a guarantee you will be able to live a spiritual life. Amrit Sanskar is open to all, from any gender, background and non-discrimnatory on caste lines.